This fighter plane, designed by British engineer Reginald J. Mitchell in 1936, has become one of the most famous fighters of all time. The elegant plane had a linear engine, retractable undercarriageand elliptical wings with built-in armament. These machines, nicknamed "Spits" by the Allied forces, were predominantly deployed by the RAF as standard fighters during World War II. Intro.... TheSupermarine Spitfire, a British single seat fighter aircraft was used by the Royal Air Force throughout the Second world war and into the 1950's. 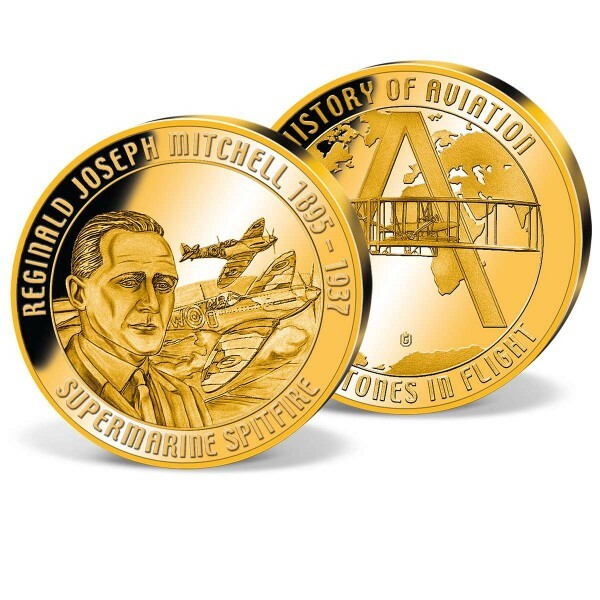 This historically detailed gold plated commemorative features the submarine spitfire and its engineer.